I think the biggest news here is that you can now get a new MacBook for only $999. 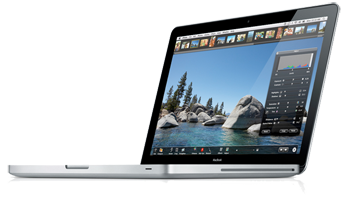 This machine is really yesterdays laptop, price-dropped to reflect the consumers want of the new redesigned MacBook. It’s an easy way for Apple to get new customers and users at a price-point that, in today’s economy, will appeal to a lot of buyers. The New MacBooks, however, are definitely a generational leap in terms of both performance and style. This is the first major redesign for the Macbook (and Macbook Pro) line in many years. On a recent MyMac Podcast, we talked about how the then current MacBooks really were not much different, at least cosmetically, than a G3 / G4 iBook. More powerful, sure, but they looked too similar. The new aluminum case with the black glass bevel screen are simply gorgeous. They look different in so many ways that, in one fell swoop, made the older Macbooks look clunky and dated. The look of both new laptops, MacBook and MacBook Pro, look somewhat similar to the first generation PowerBook G4’s, with the silver case and black keyboards. (although the original G4’s were Titanium) The screen design itself looks like it was taken directly from the black and aluminum iMacs. This is not a bad thing! Still and all, design will only get you so far. (Hello, Sony laptops!) And with Apple, it usually goes without saying that a new design will coincide with a new processor and other upgrades internally. First, the bad news. The new MacBooks do not have a Firewire ports at all. Why would you need a Firewire port, you ask? Well, besides the ability to connect an external Firewire hard drive (you can still use a USB hard drive) you cannot boot these machines into target disk mode. This may not be a deal breaker for you (and it won’t be for the vast majority of potential buyers) but it is a huge drawback. Apple pioneered this technology, and most agree that Firewire is superior to USB 2.0. Other posts include a mini display port for connecting to an external monitor, audio in and out jacks, two USB 2.0 ports, Gigabit Ethernet port, and of course the MagSafe power port. All good. Inside, the new MacBooks run at either 2.0 or 2.4 GHz via the Core 2 Duo. Each sports standard 2GB of RAM, upgradable to only 4GB, which has to be an Apple design decision. There is no reason these laptops could not support more RAM, but I think Apple wants buyers to move up to a MacBook Pro for more RAM. Oh, wait, sorry. The MacBook Pro also only supports up to 4GB of RAM. Very odd, as the processor and bus speed clearly can handle more RAM. All MacBooks still sport the 13″ screen, but driving all the graphical horsepower now is the new NVIDIA GeForce 9400M graphics card with 256MB of RAM. This is more than ample to run almost any game made for the Mac. In fact, the new Need For Speed was shown running on a MacBook during the event. The hard drive is 160GB to 320GB, as well as an optional 128GB of solid-state drive like in the MacBook Air. These are fantastic machines, no doubt. The MacBook Pro’s that were released today have the same 15.4″ display, and takes the same basic stylings as the new MacBook. The display is being driven by the new NVIDIA GeForce 9600M GT graphics processor. Depending on which MacBook Pro you select, either 2.53GHz or 2.8GHz, the GeForce has either 256MB or 512MB of RAM. 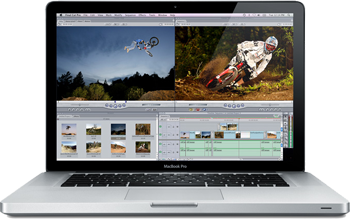 Dual Display and video mirroring is supported, and the top of the line MacBook Pro can also power the 30″ Apple display. Strangely, the MacBook Pro does have a Firewire 800 port, but no Firewire 400. The Firewire 400 is much more common than the 800 variety. Where is the 17″ MacBook Pro? Is Apple abandoning the Firewire 400 port? Let’s hear your opinions and observations below! all images ® Apple, Inc.